Acknowledging that "there is more work to be done" to ensure that patients with mental illness and addiction do not face discrimination in their health care, a presidential task force made a series of recommendations including $9.3 million in funding to improve enforcement of the federal parity law. The long-awaited report is the product of a task force President Barack Obama announced in March during a speech about the opioid epidemic. ACMA's Compass Directional Training program is designed to minimize the time and resources health delivery systems normally dedicate to annual competency training for nurses, social workers and physician advisors that coordinate care, both inside and outside the hospital setting. Take advantage of the 2017 Compass Presale: start or renew a three-year subscription to be one of the first to experience Compass 2017 AND save 50 percent on your subscription! This offer is only available through December 31, 2016. The ACMA CE Center provides members with access to free continuing education opportunities. 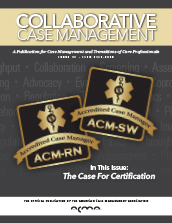 Visit the Members Only section of acmaweb.org to stay informed about timely case management topics, watch video webinars and take quizzes to earn credits for reading the Collaborative Case Management journal. Check out the CE Center to begin earning CEs today. The role of nursing IT leaders at provider organizations simultaneously is becoming more high-profile and strategic as the healthcare industry shifts to valuing quality over volume, both executives and consultants believe. The increased use of electronic health records has been key to that evolution because nurses generally spend more time with patients than any other clinician, says Texas Health Resources Chief Nursing Informatics Officer Mary Beth Mitchell in an article published by Healthcare Informatics. Recently, Tom Frieden, M.D., the director of the CDC, delivered sobering news regarding the staying power of Zika during The Atlantic's CityLab conference at the InterContinental Miami hotel. Dr. Frieden described the spread of pathogens like Zika as the "new normal" in an age of global travel and trade, dense metropolises and climate change, which is fueling migrations across the planet. A new rule in California will require hospitals and other health facilities to protect employees from abuse with violence prevention protocols — and the regulation is a model that could spread to other states. The rule, approved recently by the California Occupational Safety and Health Standards Board, could take effect as early as January, according to an article from Kaiser Health News published by National Public Radio. The federal government is temporarily blocking more health insurance companies from automatically moving customers who become eligible for Medicare into Medicare Advantage plans while officials review the controversial practice. They also will issue rules soon for plans that already have permission to make these switches, known as "seamless conversion," according to a memo from Michael Crochunis, acting director of the Medicare Enrollment and Appeals Group at the Centers for Medicare & Medicaid Services.